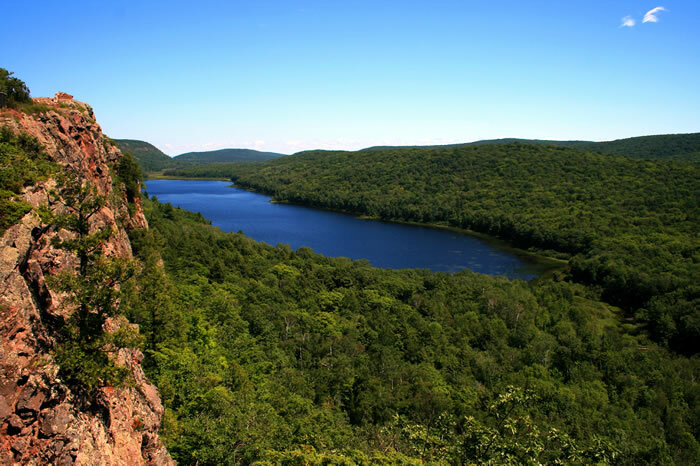 Lake of the Clouds is one of the premier hiking spots in not only the Porcupine Mountains State Park, but in all of Michigan. Walk only a short distance over a beautiful trail that winds through the woods or take the ADA access trail to the escarpment and view the majesty of the Lake of the Clouds hundreds of feet below. A Michigan Recreation Passport is required to access the overlook. The lake is fed from the east end by the Carp River and eventually empties into Lake Superior on the boundary between Ontonagon and Gogebic County. There are over 80 miles of marked hiking trails that provide amazing scenery at every bend. 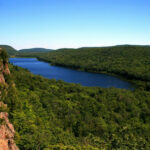 Trails include four secluded lakes, waterfalls, and high surrounding peaks. In every season, the Porkies are a beautiful wilderness retreat. There is a new visitors’ center off the South Boundary Road that acquaints people with the features and activities of the entire park. There is also a mini-museum and a multi-media presentation in a theater. Make sure to visit the Lookout Tower at Summit Peak.